32x32 pixel icons using DawnBringer's 16 color palette. 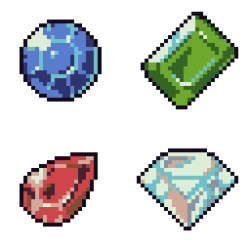 Includes a blue Sapphire, green Emerald, red Ruby, and white Diamond. Please contact me if you would like to use this work under a different license. 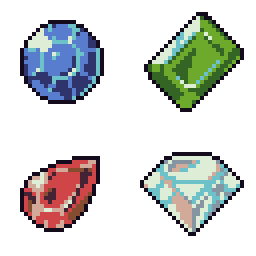 The best part of this is how you sucessfully used the palette to give brillant and nice reflections to the gems. This is truly fantastic!